We spend most of our lives at home, so it’s no wonder that occasionally we get bored of our surroundings and tired of the same four walls. We may not have the finances or motivation to give the entire house a makeover, but we can make a start with the living room, considering this is where we spend most of our time. You could simply repaint the door in a color of your choosing, but why not replace your living room door completely with something entirely different from your old one. You could choose traditional oak or go for a glass french door. Alternatively, you could opt for a sliding barn door or forsake the idea of a door altogether and hang a curtain or 1970’s style beads. 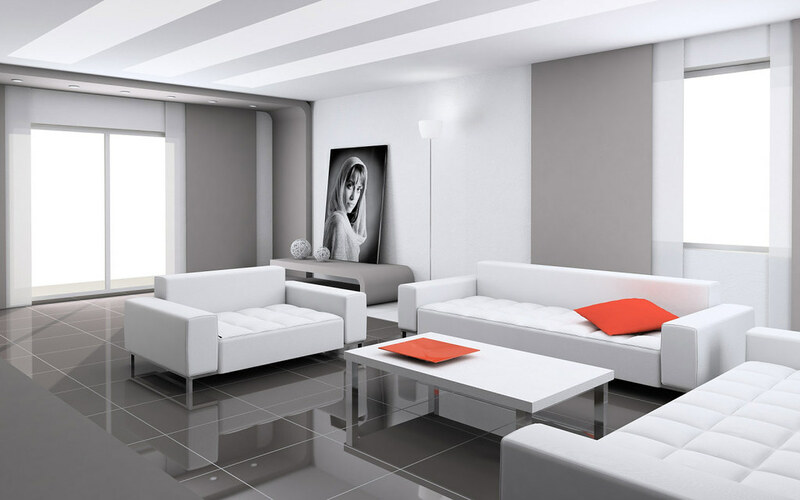 Today, many people are going for white furniture which can add a bright, clean look to a room. From sofas to rugs, the colour white can bring a touch of class to the room, especially if it is complemented by a minimalist decor. Having a lot of items in the room can make for a cluttered feel, so everything should be strategically placed to create a more spacious look. Of course, the colour white may not be your number one choice if you have children running around the house, so the choice of colour and style needs to be right for you. You may opt for an old fashioned look with a vintage chandelier and solid oak furniture, or you may get rid of the sofa altogether and opt for fun beanbag seats or a set of lounge chairs. The other area to consider is the floor. You might choose to go for plush new carpeting or a beautiful wooden floor. You could place a rug to match the room colour, or offset the theme with a vibrant colour to make the rug stand out. Create your living space by giving the room a look all of its own. As this is the place you spend most of your time, you want it to reflect your personality. You might prefer softer pastel shades on the wall for a more intimate, cosy feel, but if you are a bubbly extrovert, you may prefer louder, more dynamic colours around the room. Add works of art according to your taste as this will give your room character. From landscape paintings to the latest in modern art, choose something that will improve your mood when you look at it. You might also want to consider adding items to the room that you have designed yourself, be it a painting, piece of wooden craft, or your own curtain designs. The room should also reflect your hobbies. If you are a collector of something, display them proudly in a glass cabinet. Should you enjoy reading, set up a reading corner with some bookshelves and a comfortable armchair. Whatever you choose, create a room that you can come home to and relax in at the end of a hard day.